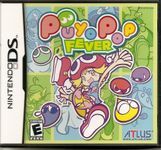 Puyo Pop Fever, or Puyo Puyo Fever (ぷよぷよフィーバー Puyo Puyo Fībā?) in Japan, is the fifth installment in the popular Puyo Puyo puzzle game series, developed by Sonic Team, released on a wide variety of systems in several regions. Sega published all the Japanese versions of the game, but due to a reluctance to carry it over to other countries, international versions of it were sometimes published by others. The publishers outside of Japan were Sega for the Nintendo GameCube, PlayStation 2 and Xbox versions, Atlus for the Nintendo DS version and THQ for the Game Boy Advance version. North America only received the Nintendo GameCube and DS versions, whereas Europe received all domestic versions, the PSP, Game Boy Advance, and DS versions. In addition, the PlayStation Portable and Xbox versions were originally intended to be released in North America but were cancelled. Sonic Team began this project to keep the series alive, but redesigned the entire package into something of its own, adding new features, new cast characters, and gameplay elements along the way. Compile, the original creator of the Puyo Puyo series, played no part in the creation of this game, as they had gone bankrupt prior to the release of Sonic Team's first Puyo Puyo game, Minna de Puyo Puyo. Despite their absence, the protagonists of the original Puyo Puyo games, Arle and Carbuncle, are included in this game and are playable characters: Arle being "lost" from her own world and Carbuncle being a hidden boss. The NAOMI port to Dreamcast was the last Dreamcast game developed by Sonic Team.